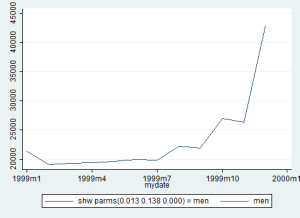 When you deal with time series data, whatever data you have, this is ALL you have to know to handle it in Stata. At least, for now. Today I am going to talk again about time series data but in a more practical and useful way. As I remembered you there, in order to work on time series, you first must tsset your data to advice Stata to recognize them. The first thing you have to control for, once you have tsset your data, is that there are no gaps in the time series (like a missing quarter or month). You can easily notice it, if this is the case in your data, because Stata will inform you that the time variable has gaps once you called the tsset command. How can you fix this? 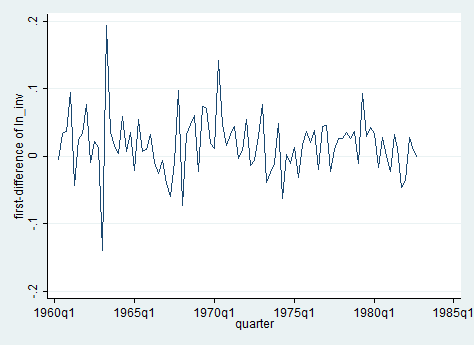 Use the command tsfill to fill in the gap in the time series. ..Then you can start play a bit! We can start by exploring autocorrelation and cross-correlation. And below you can find the output you will obtain.. 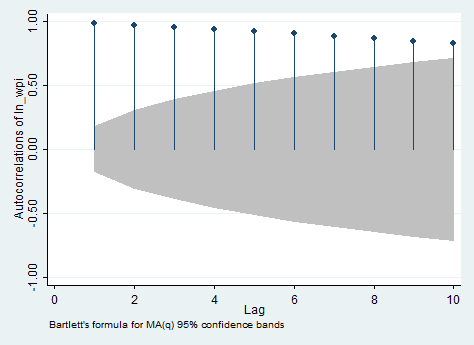 I personally dislike and find confusing this way to visualize autocorrelations. 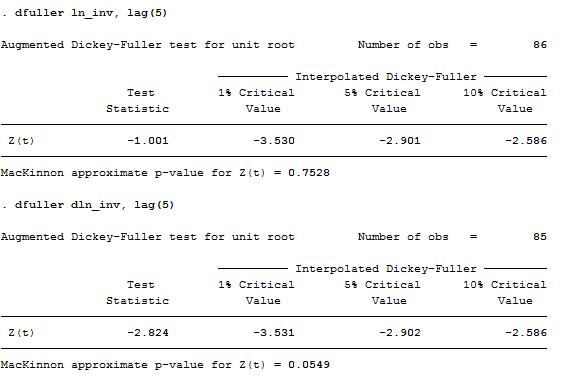 Apart for AC and PAC, this command displays the Box-Pierce’Q statistic, which tests the null hypothesis that all correlation up to lag k are equal to 0. 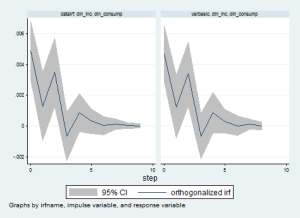 This series shows significant autocorrelation given that the p-value is less than 0.05. therefore, we can reject the null that all lags are not autocorrelated. The graphic view of the AC shows a slow decay in the trend, suggesting non-stationarity. The graphic view of the PAC instead shows no spikes after the third lag, suggesting that all other lags are mirrors of the third one. Another easy way to see that the series is non-stationary is by plotting it. As we can observe, the series displays a clear increasing trend so it cannot be stationary at all. If you need to see the table, just put the table option instead of the xlabel() one. 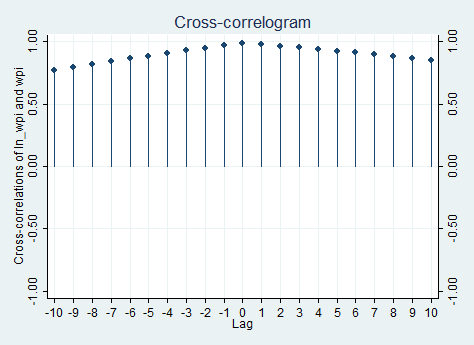 Of course, given that I only have one time series and its logarithmic transformation, the cross correlation is almost useless because, as we can expect, the relationship across the two is positive and reaches a peak in zero. There is something you cannot underestimate when using time series data that is the lag selection. Too many lags could indeed increase the error in the forecast whereas too few could leave out relevant information. There are some information criterion procedures to help come up with a proper selection of lags. The most commonly used are: Schwarz’s Bavesian info criteria (BIC), the Akaike’s information criteria (AIC) and the Hannan and Quin. The criterion is that you select the model with the smaller BIC or AIC. 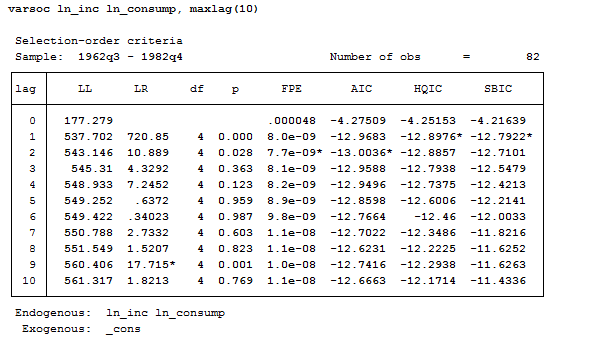 I usually trusted the BIC nore to choose the lag but there’s a useful command in Stata that allows you to plot them all in the same table and to freely choose among them. When the three criteria all agree, the selection is clear. But sometimes it can happen to get conflicting results. In this case, HQIC and SBIC suggest a lag of 2 whereas AIC a lag of 2. There are several papers on the argument so, if you need to be sure on what to believe, you are recommended to consult them. The most important thing to check with time series data is the presence of a unit root in the series. In this section, we demonstrate how to evaluate if the series has a unit root. Having a unit root in a series means that there is more than one trend. 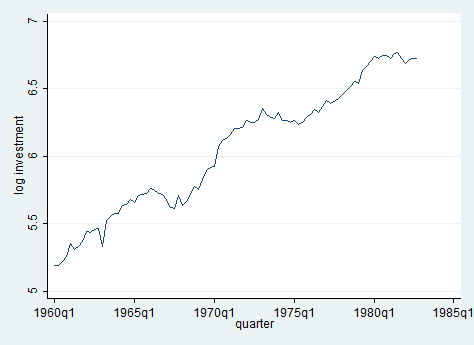 Let’s look at logarithmic transformation of income across time and test for unit root. The test statistic shows that the investment series have a unit root, it lies within the acceptance region. One way to deal with stochastic trends (unit root) is by taking the first difference of the variable (second test above). In this case, we still fail to reject the null hypothesis! Panicked? Of course, not! If we reduce the lags from 5 to 2, you can see that the series has no more a unit root. Try to believe it! Does it make sense now? I hope so. 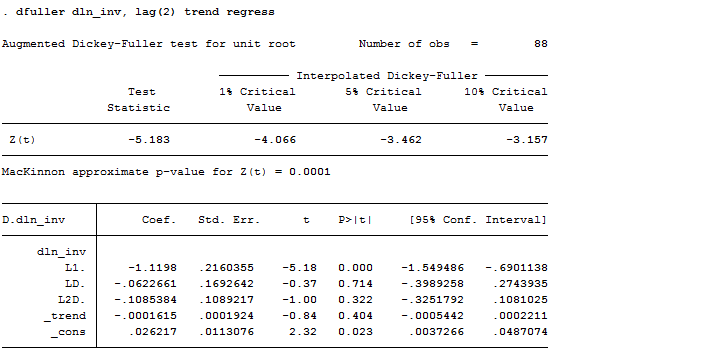 Useful tip: For panel data unit root tests, see Stata’s “xtunitroot” command. Ok guys, for today it’s all. Next time we will run into AR, MA, ARIMA and VAR. Stay tuned!